13 entries categorized "Special events"
Last Friday, I traveled to Oklahoma City for an opening reception at a very special contemporary art gallery called Untitled [ArtSpace]. The exhibit was Dinner in the Deuce, referring to the neighborhood's name, Deep Deuce. All the projects were collaborations, made up of people from different artistic mediums and different physical locations. Considering the logistics of the project and all the artistic egos involved (including my own), the end result was magical. 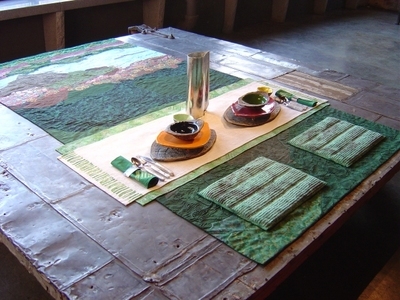 Each dinner setting had a theme and they were all very different from each other. Portable Picnic was raised off the floor so no one would step on it. The pedestal they used was one of the massive, original sliding doors from the old warehouse building where the gallery is located. We were the only group who didn't have a table, so some visitors assumed that the door was part of our display. It might make the picnic a little less portable if you had to carry the door around, don't you think? The ceramics were created by Barbara Broadwell from Edmond, OK and the pewter pieces were made by Margareta Grill from Tulsa, OK. I'm really pleased with the the way our work looks together and proud to have been part of this project. Thanks to Laura Warriner and her gallery staff for coordinating such a wonderful exhibit. I drove 620 miles in the past two days, roundtrip from Wichita to Topeka, KS on Thursday and round trip to Oklahoma City on Friday. My finger got tired of resetting the cruise control button as I left the rest areas. In this post, I'll tell you about Thursday. A few months ago, I applied for a Kansas Arts Commission Mid-Career Artist Fellowship. The Visual Arts selection panel met in Topeka a couple of days ago and I went to watch them deliberate. I won an Individual Artist Mini-Fellowship from the KAC in 2000 and in 2001, I was on the selection committee myself, so I had a good perspective on the process already. The public and the applicants were invited to attend, but I was the only person to actually turn up. I arrived late in the morning because I was #41 on the agenda of 43 applicants (the W name, you know). When I came in, the director of the KAC, Llewellyn Crain, grabbed me and pulled me into another room. I had met her about a year earlier, so she knew who I was. I was told that I was welcome to observe, but I wasn't allowed to interact with the panel members in any way. As I walked in the room, I realized I already knew some of the panel members or at least knew who they were. One was Dr. Patricia McDonnell, the director of the Ulrich Museum of Art at Wichita State University. I love this museum, as it's "the" place for great contemporary art in Wichita. 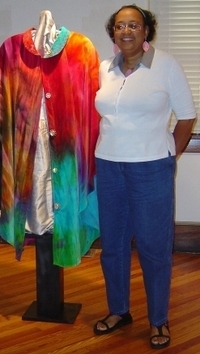 Another was Novalene Ross, the former director of the Wichita Art Museum and a true leader in the Kansas arts community. One board member from the KAC is required to be there and conduct the proceedings. This time, it turned out to be a man I used to work with at IBM. We worked in the same branch, but were located in cities a distance apart, so I wasn't even sure that he remembered me from 20-25 years ago. I did not know the other three panel members. The only negative things mentioned were that my statement was more a biography than a statement and that I had a great resume, but didn't have enough solo shows on it. This is my year to look for solo shows, so if you have one to offer me, I'm yours! I'll even lick your boots, if you want me to, but only if it's done in public and advertised as performance art. When the scoring was finalized, I was allowed to introduce myself. I absolutely love to hear myself talk, so I also took the opportunity to tell them my positive experience with receiving a mini-fellowship and how my art was tremendously affected by listening to the comments of the panel that year. Being a panel member is a lot of work, so I wanted them to know what an impact they were having on the artists and the ripples the fellowships sent out into the world. I was allowed to look at the final scores after the process was over, but I was so busy talking to people that I barely got a chance to glance at the sheet before they wanted it back. Out of 19 in my category, I was ranked 5th. However, there are two other (much smaller) groups whose scores will be integrated with ours and they are only giving awards to the top eight. I think I'm on the bubble as to whether I'll receive an award or not, but I won't get upset if I don't. I saw how tough the competition was this year and I know I did well, so I am happy with my ranking either way. The way I look at it, I had the opportunity to have a number of art heavyweights see my work and critique it, plus I had the chance to talk to most of them personally. Forget the fellowship money, that experience was priceless. 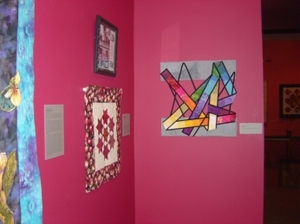 The Wichita Art Museum just installed an exhibit of masterpiece antique quilts from the Shelburne Museum in Vermont. During the planning stage, the chief curator also asked the local quilt guild to display work from some of their members and, a few months ago, they sent me a letter asking if I would be interested in being part of this. My first reaction was, "Do they know what they are getting into?". Hmmm, antique quilts, traditional quilts from the guild members and... my work, which would be incredibly different from the rest. However, I said yes and they selected Connected, which at least hangs on the wall. That's about as traditional as I get these days. I haven't been a part of the Prairie Quilt Guild for years, but I'm back on the list again after they realized I was no longer a member and sent a tactfully worded email requesting that I send in my dues, because the exhibit was for members only. As a bit of trivia, PQG has approximately 900 members, making it the largest local quilt guild in the world and virtually every member creates very traditional work. In fact, many of them don't think I've been successful as a quilter because they've never seen my work at the Kansas State Fair. Ha! Can you imagine the reaction of the state fair judges if they were asked to judge a quilt that is 1-1/4 inches wide by 70 yards long? They'd probably melt into a puddle. 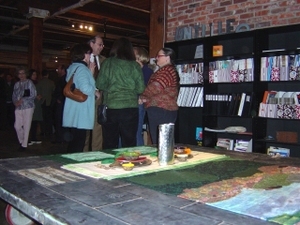 The opening reception for the museum show was Friday evening and they held a quilt symposium on Saturday afternoon. One of the speakers was my friend, Anita Holman Knox, who is one of the nicest people around, as well as a very talented art quilter. Her hand dyed fabric is positively delicious, as I have discovered by nibbling some of her scarves when her back was turned. During the week, she is the acting director of the Kansas African-American Museum and she gave an excellent presentation on African-American quilts. The only problem she experienced was that, by the end of the day, her scarf had little bite marks around the edges and I don't think they were all from me.